In terms of location, the Restaurant Gasthaus zum Rathaus is not really a place I intended to go but circumstances led to me visiting it. And now I would probably go again. It is not really close to Zurich but it is located beautifully next to Lake Zurich and in summer when it is still bright in the evening (and doesn’t rain as it did that night), it is a great location. But not only that, the interior of the restaurant is lovely and appealing – with friendly and swift service. 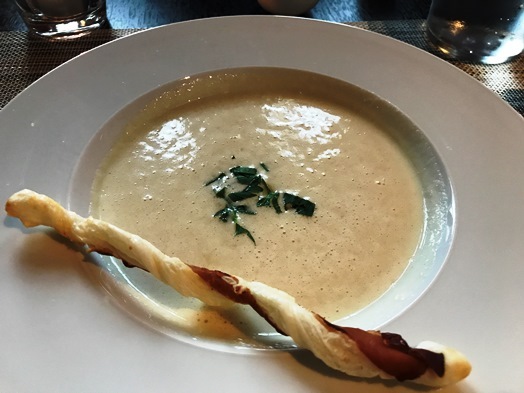 The “Riesling soup with a ham wrapped pastry” (CHF 14.00) was a bit tiny as a portion but lovely in taste. 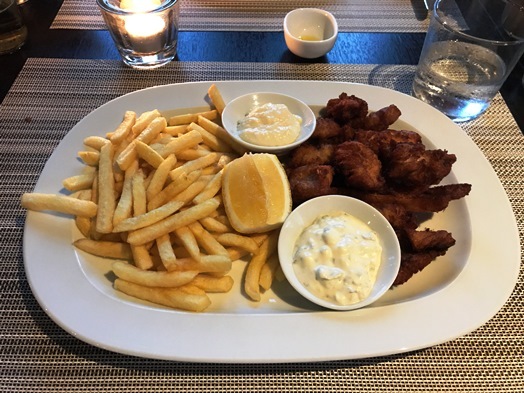 My main course, the “Lake Zurich Fish ‘n’ Chips (deep-fried mixed fish in beer batter from the lake of Zurich – catch of the day with French fries, accompanied by tartar and garlic mayonnaise)” (CHF 29.50) were – on the other hand – quite a portion. And they were not only quite a portion but they were also absolutely tasty. Only the garlic mayonnaise was a bit too intense but otherwise perfect. Overall, I was quite positively surprised to find a restaurant like this out there – something I had definitely not expected. Just make sure you book a table in advance as it was quite crowded even for a Thursday evening.